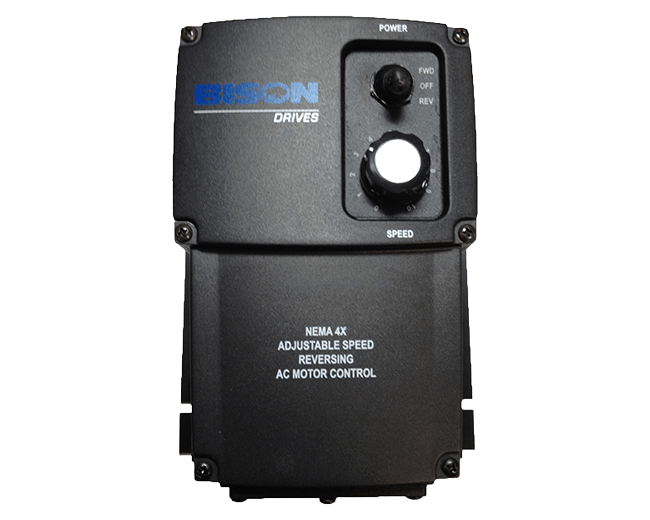 The cost-conscious and compact chassis design of Bison VFD Chassis Drives maintain the industry standard for mounting hole location and the coded LEDs make it easy to visually determine the drive status. With it’s compact design and application flexibility, this is an excellent choice for most AC applications. Compact Size: 4.3” x 3.7” Easy to mount in small spaces with industry standard mounting hole pattern. Easy to Calibrate & set up: On board trimmer pot adjustments for boost, maximum speed, acceleration, deceleration. Torque “foldback’ feature: Allows up to 200% torque for short periods to overcome intermittent peak loads, then reduces the torque to a preset safe level. 16kHz switching frequency, with option to change between 4 and 16 kHz in the field: A high switching frequency results in quiet motor operation. Adjustments to a lower frequency if desired can be done in the field.